I would like to thank my Customers, friends and family for their support and business! It is very much appreciated and I enjoy creating all your personal leather items! OMG!!!! I just got the wallet and it's wonderful. I've put in my money and it's ready to go. Thank you so much for making it. Can't wait to show it off. The case arrived and I have been using it for the past couple of days. The sizing is perfect and it is working out exceptionally well. The build quality and craftsmanship is outstanding. Thank you very much for providing it.
" As a repeat customer I must say again how impressed I am with your craftsmanship. The construction, fit and finish is simply extraordinary. Your work continues to amaze me. All the best to you and Skookumhorse Ranch." ​"The cell phone case is beautiful and very well made. 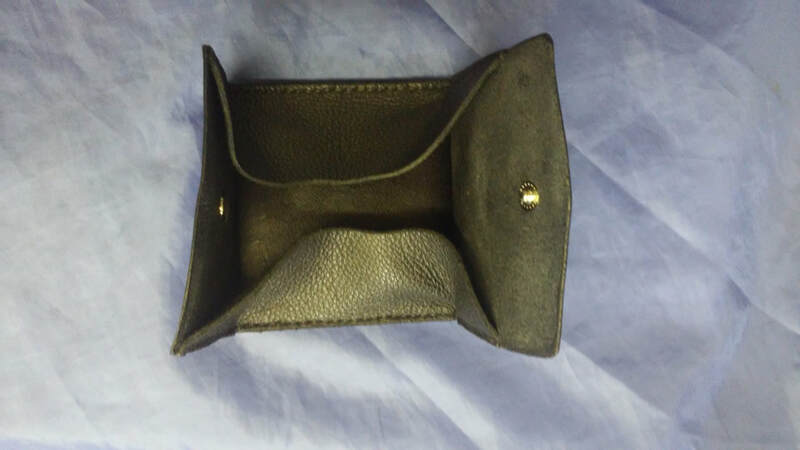 Thank you again"
​Here is a long overdue thank you for your superb leatherwork – there is none better. It all started with a belt and a cell phone case for my daughter, Kaitlyn. I was so impressed, I followed with orders for spur straps, knife sheath, tie down, rhinestone studded breast collar and matching bridle, saddle and horn bags, batwing chaps, rifle scabbard and, most recently, custom photo albums. I have to say that your consistency in providing excellent craftsmanship in each item is something which is increasingly difficult to find in today’s world and something which Kaitlyn and I both value highly. There is no doubt that every task you undertake ends in an heirloom quality item – not only a thing of beauty, but durable. Knowing how busy you are I am already working on a design for another photo album for next year. 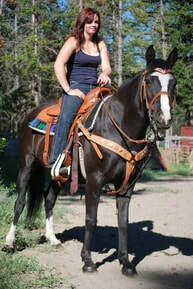 Please find enclosed photos of Kaitlyn making good use of the scabbard and saddle bags which you have done for her and the latest photo albums. We wish you continued success crafting such high quality leatherwork. ​I had been searching for a high quality, properly fitting vertical cell phone case for my iPhone for over two years. After trying several other substandard, poorly functioning phone cases and tolerating apathetic customer service from myriad phone accessory vendors, finding Catherine Clinkemaillie was like discovering a large diamond in a field of common stones. She listened carefully to my specifications, and then proceeded to make me two custom iPhone cases that are beyond perfect! Catherine is very, very good at what she does, and her materials, craftsmanship, and service are excellent. If you want lifetime quality, no excuses, and a craftsman who does what she says she will do, when she says she will do it … then do yourself a favour and contact Catherine. You will be fully satisfied … no, make that delighted! I will go directly to her for my future leatherwork needs. Please contact me if you have any hesitation about Skookumhorse Custom Leather Products. "It is beautiful, nice thick leather , fits my phone perfectly, magnetic snaps feel very solid, I have no doubt it will hold up longer than my phone." ​"It is wonderful and looks absolutely beautiful, the workmanship is outstanding and thanks to you the phone fits perfectly! I will enjoy if for a long, long time!" "The cellphone case is exactly what I hoped it would be. I am a completely satisfied customer and hope I can send you some business. " ​"I did receive the case and it is magnificent. Everybody who has seen in thinks it is beautiful." "I would call the cell case the Brinks vault of cell cases. It is exactly what I wanted. " Met these two lovely Canadians whilst horse riding down under, very interesting people both of them. Managed to get a business card of Cat and checked out her website. Liked what I saw, placed an order then communicated via e-mail until we both agreed on designs for 2 note books and a belt. Who would have thought that placing a customized order so far away would be sooooo easy! Parcel arrived in no time and when I opened the box the goods were beyond my expectations. Thanks again. I received my IPhone case and it is WONDERFUL!!! It is perfect in every way. Fit, finish, design and function are all perfect. I'm not sure exactly what to say when presented with excellence in an era where sub-par is par. I guess all I know to say is...THANKS! ​"I just wanted to let you know that the case is very nice looking and quality is superior. 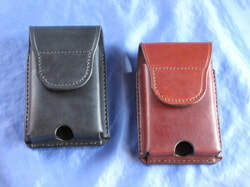 This case is exactly what I have been looking for but have failed to find this calibre of craftsmanship and quality, I love the thick leather and strong magnet as well as the color." "I received the case and love it. The cards and phone fit perfectly inside and the case is beautiful." "Thank you for doing a great job and for accommodating me with the changes I dreamed up along the way." "I received the sunglasses case today. It's great, exactly what I wanted. I'd like to thank you for working with me on this, for the prompt service and the excellent craftsmanship." 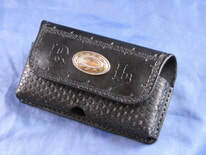 "Thanks to you, I know have a wallet and a belt that can withstand what I consider to be normal use. I look forward to years of use from both of them. " ​"I just received my cellphone and knife case. They are even more beautiful than I thought they would be!" "The case is great, it looks just like I had been hoping for. Thank you so much for all the extra effort that you put into making my case a "one off", everybody asks me about it." ​"Thank you, it is wonderful to see such great craftsmanship." ​"The horn bags are simply incredible. Your work is amazing, the craftsmanship and detail extraordinary." "My phone case is the perfect size and fit, it looks extremely nice. Thanks ever so much." "The knife cases arrived today. I was right to give you the work. Nicely done! Used to own a Leather work business for 20 years!